Maintain a snug, comfortable fit around catheters, IVs, tracheotomies and tubes with Sterile T-Drain Sponges. The unique pre-cut design allows these four inch by four inch gauze pads to conform around most medical tubing, making them extremely easy to use. Sterile T-Drain Sponges are made with a poly/rayon fabric blend to provide gentle protection against patients' skin. 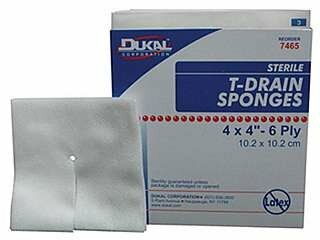 Each sterile package includes two Sterile T-Drain Sponges and each box includes 25 packages. Pre-cut design fits around most catheters, IVs and tubes. Made with poly/rayon blend for gentle protection against patients' skin. If you have any questions about this product by Dukal, contact us by completing and submitting the form below. If you are looking for a specif part number, please include it with your message.